TAITRA, entrusted by Taiwan’s Ministry of Foreign Affairs, led a delegation of 6 companies to participate in the Taiwan-Saint Lucia Partnership Trade Exhibition 2016. The event was held at Johnsons Marine Center from Nov. 25th to 27th, 2016, allowing participants to explore business opportunities in the Caribbean. 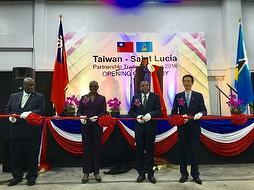 The Embassy of Republic of China (Taiwan), in partnership with Saint Lucia’s Department of Commerce, International trade, Investment, Enterprise Development and Consumer Affairs, has organized the trade show annually since 2008, fostering deeper trade ties between Saint Lucian and Taiwanese businesses. The exhibition has increased in both the number of participants and the public’s interest. It is now one of the most popular trade events in the region. This year, a total of 72 Saint Lucian and Taiwanese companies teamed up to show off some of their best products and services. The show attracted thousands of patrons eager to either see or patronize the businesses offering products. According to the reviews of the Voice, Saint Lucia’s local media outlet, exhibitors were pleased with this year’s organization of the event and patrons also expressed their great excitement at being exposed to goods and services of high quality from Taiwan and Saint Lucia. Saint Lucia, an island in the Caribbean, has a relatively large and lucrative tourism industry, attracting an estimated 350,000 visitors per year. They heavily rely on external trade because of their narrow range of resources. The primary imported products are food, manufactured goods, machinery, transport equipment, chemicals, and fuel.